In your heavier days, your eyes were probably one of the last things people noticed about you. But now that you have improved your body contour through weight loss, there's no better time to dazzle everyone you meet with bright and vibrant eyes that show off how good you feel inside. The reality is that dramatic weight loss causes a sunken and sagging look in the skin around the eyes. This is because the skin on this area of the face is both thin and sensitive, so it is not as resilient to weight fluctuations. To remove bags on the lower eyelids and tighten skin on the upper lids, Dr. McNemar performs eyelid surgery for post weight loss surgery patients in the Bay Area and Northern California. Request a private consultation where Dr. McNemar will share your options with you and give you his honest, professional opinion on how plastic surgery can help you reach your ultimate weight loss and cosmetic goals. You had many benefits in mind when you chose weight loss surgery in the Bay Area - benefits like improving your health and energy, reducing your risk of certain illnesses, and enhancing your self image. To match your thinner, improved body shape, you need to be able to enjoy a rejuvenated facial complexion free from sagging skin. Dr. McNemar understands that eyelid surgery and other post-bariatric plastic surgery procedures can help you complete your journey, and he takes great pride in being able to help so many people like you who have achieved their weight loss goals. Dr. McNemar performs eyelid surgery as an outpatient procedure in most cases, meaning that you can go home the evening after your procedure. When performed as a stand-alone procedure, eyelid lift usually requires 1 to 2 hours of surgical time. The techniques used for the upper eyelids are different from those used on the lower lids. Depending on your needs, Dr. McNemar will explain the different surgical options so you understand what to expect during surgery and recovery. For upper eyelids, Dr. McNemar makes incisions along a patient's natural skin folds, separating the skin from underlying muscle and fatty tissue. Once separated, the excess skin which is causing a wrinkled appearance is removed and residual fat which is weighing down the lids is carefully re-sculpted before the incisions are closed. Dr. McNemar performs lower eyelid surgery to remove fat and tighten skin appearance under the eye, but the incision options are different. In many cases, lower eyelid incisions can be made inside the eyelid, so there is no external scarring. Eyelid surgery removes bags, pouches and excessive skin from under and over the eyes. The procedure can make a substantial difference in the way you look and feel, particularly if sagging eyelids make you feel bad every time you looked in the mirror. In extreme cases, some post weight loss patients have excess upper eyelid skin that actually causes vision impairment, and eyelid surgery takes care of more than just a cosmetic concern. Dr. McNemar can perform eyelid surgery as a single procedure or in conjunction with other facial cosmetic surgery options such as brow lift or face lift in San Ramon. Combining procedures can help you achieve a full-face makeover that helps you start fresh after achieving your weight loss goals. If you're considering cosmetic improvement after bariatric surgery in the Bay Area or Northern California, you deserve to have your procedures performed by a plastic surgeon who is board-certified by the American Board of Plastic Surgery. 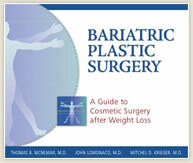 Request your consultation today and receive a complimentary excerpt from Dr. McNemar's latest book, Bariatric Plastic Surgery: A Guide to Cosmetic Surgery after Weight Loss. Or, call (925) 866-0177 for our San Ramon office or (209) 834-0626 for our Tracy office to make your appointment.